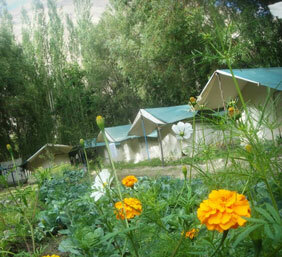 Turtuk village is one of the remotest and most beautiful villages of Ladakh. It is located at the last corner of Nubra valley at India - Pakistan border and situated on the bank of mighty Shayok River in Nubra valley. The village was a main part of the silk route, the gateway of Ladakh to Xingang to China, to Mongolia and the village chieftain shared strong economic and cultural ties with the Kings of Ladakh and Tibet. Tibetan Buddhism was popularly practiced in the past but now the about 600 residents are entirely Nurbakshi Muslim. The terrain to Turtuk is a swirly mountain road that descends into a valley abruptly. In summer, Turtuk is full of greenery with wheat and barley fields in bloom. The riversides and feet of lofty mountains are dotted with sea buckthorn bushes in full bloom with pale, shiny yellow fruits. Every house is fenced with Apricot and Apple trees. Turtuk's apricots are the sweetest in the entire region of Ladakh and no matter how many one eats, the stomach doesn't act up. Vegetables including cauliflower, cabbage, spinach and carrots are cultivated and stored for the long and hard winter. Inside the village is a world apart, reminiscent of a scene out of The Man Who Would be King. People either belong to Aryan or Mongol race. Villagers are fair, rosy-cheeked, with aquiline features. Many have auburn hair. The houses, of stone and wood, stand in the shade of giant apricot, walnut and mulberry trees. Water channels gurgle through the winding village lanes. Old women wearing gorgeous silver tiaras, their hair plaited in a dozen braids, sit winnowing barley. Village have beautiful wooden mosques dating back to 1690, boasts a Minar built entirely of latticed wood, and exquisitely carved ceiling panels. Turtuk village, were only opened to foreign tourists in 2010, so they are still quite new in their contact with tourists and the West, and rather unexplored. A trip to Turtuk is in every sense a treat - culturally intact, untainted by tourism and simply delightful. We are hoping to get comments from you. This adventure is one that you will come back to and cherish for a lifetime!